I attempted to download the Mario Kart 8 DLC the other day because my girlfriend wanted to play as link. So, I attempted to pay for the DLC one and two pack using a Visa gift card I received for Christmas. I tried it two times thinking I might have gotten the information wrong, but both times my card was rejected. I had already paid for other things with the card so I assumed that it was because it was asking me for information such as the name of the card holder and a zip code. So, I registered the card so that it would have those things. I paid for the DLC and it worked perfectly, but after checking my Visa balance it says I made three purchases of the DLC. Two of them say "Pending..." so I am hoping this means they will be refunded, but it has been almost a week since then and nothing has changed on my balance. I know they will most likely be refunded, but it has almost been triple the amount of days the refund should have taken. Should I be worried if the charges are still held after a week? Edited by ThePalm-TopTiger, 04 January 2015 - 01:39 AM. Could always give the old Ninty a call. You have a pretty decent chance of getting a refund, especially with the screenshot i would imagine. Yep, I would call Nintendo no matter what. Just to make sure. I contacted Nintendo and they said the longest they have heard of a credit company holding money from one of their orders is about a month and that with time it should be fine. Then again anytime something like this has happened to me it has usually been refunded within 24 hours of the purchase, so this isn't helping my nerves much. I'm going to contact Visa just to make sure the money is only being held, but the last time I contactacted a company about a gift card (American Express) I got somebody on the phone that I could not understand and didn't want to help me at all. I think the nintendo store just has issues with gift cards, I tried to use mine. I wouldn't recommend using them on most online purchases. I tried to put $20 into my account from a visa one and the transaction didn't go through, but the $20 is being held. Just got off the phone with customer service today and he pretty much said as long as it doesn't process for 10 days, the money will return. Since yours was a digital download, I doubt the multiple charges would stay, but its best to call the number on the card and figure out their policy on held transactions. Yeah, i think you'll see a refund. 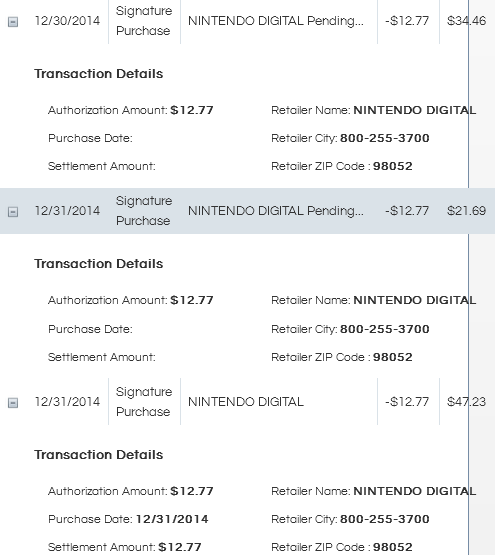 It's not like you can buy the same digital game more than once (with the same NNID). It's really a question of time. But, i'd call VISA and see what they have to say on the matter. At least they will give some sort of date as to when you can expect the refund. What Mario Kart 8 Character will you use?